Out of the people who specified an amount of cows to accept, they said 45 was the minimum(except for one who was willing to take 40). 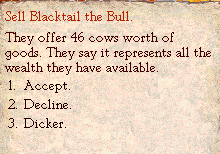 Good enough for goons, good enough for me, so I accepted this first offer. 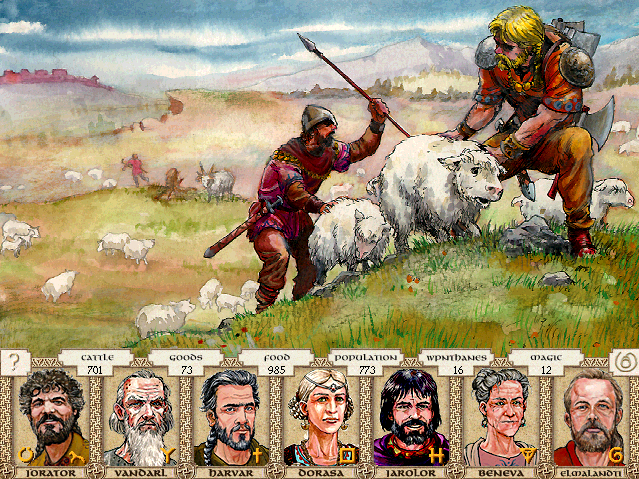 A young shepherd reports the theft of several sheep. From his description of the ragged-looking men, they are surely outlaws, men stripped from the protection of their clans. -Hunt down and kill the outlaws. -Pardon the outlaws, recruiting them as weaponthanes. You have to be quite the miscreant to get outlawed from some of the rough clans of this frontier. Since they're outlaws, we could do anything we wanted with these men, stolen sheep or no stolen sheep. I could bring these men to heel aided only with a child and armed only with a piece of straw. Better to steal sheep than cows or pigs. Thieves start with something small, like sheep. Then they move on to larger targets. It's harder than it sounds to catch a couple of outlaws in this terrain. We could use a couple more men who know how to hold a weapon.